Spiderman, snakes and sticky tape, plus skippers sledging skippers! "That was Spiderman stuff. You don't do that as normal human beings. He can do freakish things, I'm used to it now." "You get guys that are good. Then you get guys that are excellent. And then you get AB de Villiers." "I think Virender Sehwag saved the IPL by picking me." "There is plenty of room for banter or what we call sledging. If I play Uno with my daughter, there's lots of banter, we sledge each other, but we don't abuse each other." "I know he's your captain but you can't seriously like him as a bloke." And Tim Paine proves it with this line about India captain Virat Kohli to Murali Vijay! "We have this yellow tape in our kit and it is connected to some padding, but the sticky stuff is very sticky and I felt like it could be used to collect some stuff from the side of the pitch, and I have been charged with ball-tampering." "Maybe cricket isn't for you, you'll ask yourself… will you return? Yoga will be such a fulfilling experience." "Faf is being held together by... I was going to say by sticky tape, but that's probably not the right thing." "In the back of my mind I suppose there is a tiny ray of hope that I may one day be given the privilege of playing for my country again, but I am resigned to the fact that that may never happen." "I was never going to be the best player the world has ever seen but one thing I can be proud of is that I genuinely believe I have become the best player that I could have become.."
"I'm happy Cookie was on the field to see that wicket. He is my best mate and he has been brilliant, there for me all the time. What he has brought to the dressing room, the team, what he has done for English cricket as a player and captain is above and beyond." "It will be nice to get someone in at first slip who can actually hold on to a few. Who knows how many wickets I could have got if he could catch!?" 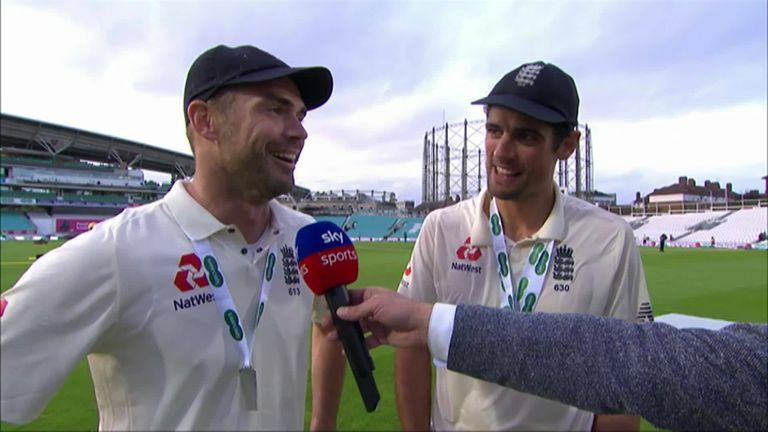 Anderson, though, could not resist a sly dig about Cook's fielding! "I'd like to see Jimmy go and get 600 and then whether he wants to try and knock off one of these dodgy spinners that are still at the top of the tree." "Geez Davey! This celebration is the equivalent of Sir Ed Hillary giving it large climbing his front steps, post Everest!" "I'd back Alyssa Healy against the anacondas, the way her form's been at the moment." Before then watch every ball of England's Test and ODI series against Windies, starting with the first Test on Wednesday January 23.